For me, yesterday was just about the perfect Father’s Day. My wife made French toast and bacon for breakfast, there were burgers off the grill and milkshakes and a movie for dinner (we pulled The Increadibles off the shelf… hard to believe that it came out in 2004…), and in between there was plenty of time for video games. For that part of the day I did the usual garrison patrol in WoW, a few missions in War Thunder, and a little more time in EVE Online for Burn Amarr. But my daughter said she wanted to spend time during the day playing a video game with me, and none of those games are really on her list these days. So I asked her what we should play. There were a number of options. But she went straight for her current passion of the moment, Minecraft. That gave me a moment of pause. I’m not anti-Minecraft so much as the difference between my daughter and I in Minecraft ability and knowledge is such that I wasn’t sure we could actually play together in a way that wasn’t frustrating to both of us. She wanted to run off to one or another special server that had various mods or offered PvP or whatever, while I was pretty much at the most basic, vanilla level of ability. 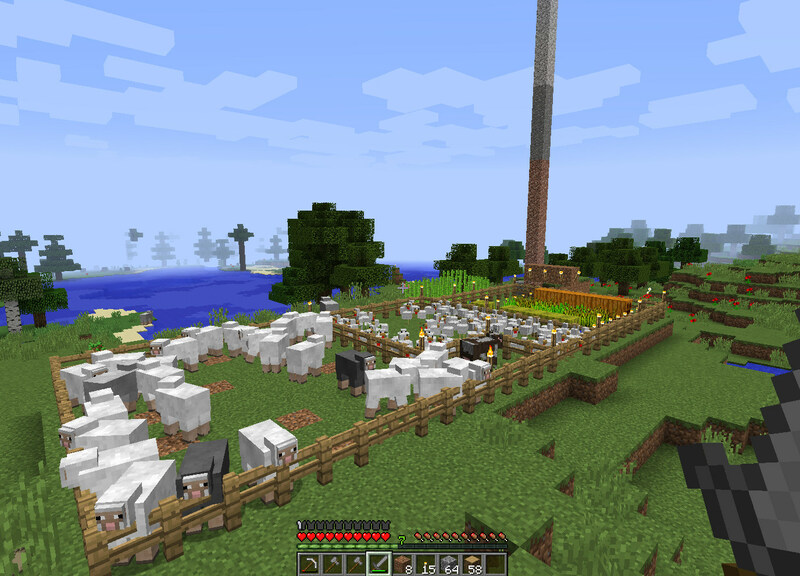 I could move around, dig stuff up, but hadn’t really done enough to have much in the way of Minecraft knowledge. So my suggestion was that we start our own server with survival mode set so that she and I could play together and she could help me along without having other server residents coming along or confusing the issue. I went to the Minecraft site and logged in (I’ve actually owned a copy of Minecraft for a couple years at this point and, surprisingly, remembered my account name and password) and grabbed the Windows version of the server. That was simple enough to get going… at least once I figured out that I needed to open up the EULA.txt file and edit change the entry “eula=false” to “eula=true” in order for it to run. We then both logged in and started our journey. My daughter, well versed in the mechanics of the game, immediately dug us out a shelter and built a furnace and crafting station as well as some torches. Then we harvested resources while the day lasted, then hid in our shelter as night came. Impatient with that, she built us each a bed which allowed us to “sleep” through the night cycle. Still, the monsters sometimes linger and I managed to wreck a part of our shelter when a creeper jumped me in the light of day. I managed to hit him and run away, avoiding the explosion. However, it happened right next a farming plot my daughter was preparing, digging a big hole where it was setup. So she decided we needed to move. We were in a hilly area where monsters could sneak up on us easily. She ran off to a flatter area to setup shop and I promptly got lost trying to follow her. Her statement that she was on “the big plain over here,” yelled across the house, wasn’t all that helpful. She eventually found me and brought me back to our new shelter just as darkness fell. The next morning I sat around reading a site about crafting in Minecraft and harvesting materials that she needed while she assembled a farm on the roof of our shelter… and built a tall spire with torches all over the top to guide us home as darkness fell if we wandered too far and got lost. That happened to both of us, which made me feel a bit better. We ended up with a mass of chickens and more eggs than we could ever use. However we needed the eggs, along with the pumpkins (big orange row at the far end) and the sugar cane (green bamboo-like plants in the near distance) in order to make pumpkin pie for food. I spent a lot of time underground as I mined out huge areas under our shelter in search or iron ore for improved tools. I wore out a lot of stone tools along the way. I also chopped down a lot of trees and planted a lot of saplings that dropped in order to maintain a series of replenishing groves. Eventually my daughter got tired of our venture. She went off to try and build us a “proper” house, for which I harvested materials. However it wasn’t shaping up the way she wanted and she was losing interest in our simple world, so she opted to leave and ran off to some of the more exciting worlds online. We never quite got the house set. I kept pottering away for a while. There is a relaxing aspect to just mining away or tending the woods. Crafting still seems a bit clunky, though I figured out some of the shortcuts. And, of course, inventory management, always a problem. What to do with excess eggs, beside throwing them at things. Eventually I shut things down as the time for dinner approached. I enjoyed it enough that I took a peek at some Raspberry Pi 2 server options that I could just stick on the network and leave running so that either of us could drop in and continue taming the world whenever. I’m not sure we’re into it enough to buy a dedicated piece of hardware for it, no matter how cheap. It might be a better idea just to move the server to my wife’s computer and have it launch as a service. She leaves her machine on all day, while mine is powered down when I am not home. We will see if we even end up returning to our little world. This entry was posted in entertainment, Minecraft and tagged Father's Day on June 22, 2015 by Wilhelm Arcturus. It’s sweet that she played with you. :) I’m much like you when it comes to Minecraft, whereas my husband is more like your daughter. We somehow make it work with our strengths, though.